This week is the 32nd Nutcracker Market which benefits The Houston Ballet Foundation, it's academy and scholarship programs. 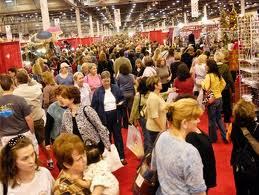 Over 325 vendors will make this the ultimate holiday shopping extravaganza. You can find almost anything from gifts, home decor, gourmet foods, toys, candles, sporting gifts, novelties, accessories, clothes, jewelry and MORE!!! If you are in the Houston area, it is definitely something to check out. I am sorry this is not much notice, but it's better than posting after the fact. Right?? Anyway, this week starting Wednesday night, Nov. 7 The Nutcracker Market will open with the Wells Fargo Preview Party starting at 7:00p.m. with food and drinks around every turn! Uninterrupted holiday shopping till 10p.m. with very limited cowards and a chance to see everything first. Every year I attend the Preview Party with about twenty other fine Houston women, we load up the bus (literally), drink, snack and shop. I'll try to take pictures, but it's hard sometimes because I get so caught up in seeing everything, socializing and shopping that pictures sometimes fall by the way side. The Wells Fargo Preview Party and early shopping is not included in the price of a regular admission ticket, this is considered a special event and a separate ticket must be purchased. The Wells Fargo Preview Party tickets are $175.00, and still available by calling 713-535-3231. The price of the ticket includes: early shopping, tons of fabulous food (if you chose to eat, I usually skip because I don't want to waste time eating and miss the shopping) and a couple of drink tickets. Not to mention that during Wednesday night, there are no crowds! It's wonderful!!! If you can't make it Wednesday night, you still have plenty of time to check out all the goodies. Doors open Thursday and Friday at 9:00a.m.- 9:00p.m. and Saturday and Sunday at 10:00a.m.-6:00p.m. a four day pass is $40, a one day ticket at the door is $13. Half price admission is everyday three hours prior to closing, children under 6 are free (not a place for children). There are NO strollers, carts, rolling bags, wagons or pets permitted inside. This picture is a simple explanation of why NO strollers, carts, etc.. are permitted into the market, it's way to crowded! Donne Di Domani sells Italian Marinara Sauce made by some fine Italian women and the proceeds are all dished out to some incredible charities. They formed a little club back in 1985 naming it Donne Di Domani, meaning "Women of Tomorrow." Participating in their first Nutcracker Market in 1989, selling $5,800 worth of Marinara sauce and turning all the profit over to charity. They now sell "THE" must have item of the Nutcracker Market. The most exciting part, the Donne Di Domani women went from raising $5,800 to over a million! 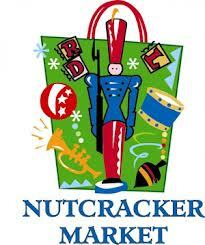 NEW to Nutcracker Market this year, and I am SOOOOOOOO excited! Her jewelry is WOW! I have on Kendra Scott earrings and a ring right now. Check this jewelry out. This beautiful booth has a storefront right here in Brenham. Known for their fabulous antiques, Christmas decor, candles, bedding, books, more antiques, antiques and all around beautiful touches, check out Leftovers at the Nutcracker Market and if you are ever driving down 290 in Brenham, go into their gigantic store. You will not be disappointed. Fun and whimsical oilcloth products. The name says it all, stuff those stockings at this booth. NEW this year!!!! They have a storefront in Houston, and their bundt cakes are not only yummy but cuter than a cupcake. NEW this year!!!! His modern twist on pearl jewelry, leather, coins and pave diamonds is stunning. I've bought several pieces from Vincent Peach Jewelry through the years during Round Top Antique Show. I'd love to add a new Vincent Peach piece to my collection. THIS IS MY ALL TIME FAVORITE BOOTH, and the place I head first every year. It's the giant booth in the back with all the incredible home decorating pieces, lamps, serving platters, trays, accent pieces, ribbon, mirrors, and on and on and on. GO TO THIS BOOTH FIRST they SELL OUT! Like I mentioned in the beginning, there are over 325 vendors, I could only list a few favorites and a few new vendors I am looking forward to checking out. The Nutcracker Market, Wells Fargo Preview Party is one of the events I look forward to every year, I can not wait to see what's in store for this year. My yearly event! Love it! Can't wait! This sounds so awesome, I'm so jealous! I love Kendra Scott, her jewelry is amazing! I just came across your blog for the first time and can't believe that we were one of the vendors you are most excited about seeing at this years Nutcracker Market. Glad to know we have fans like you, who love our cakes so much! Now just how did I find your blog..... Love Nutcracker, went opening morning. I used to go to the Preview Party but the ticket price just doesn't justify the short shopping hours. No way can you shop and eat and drink in 3 1/2 hrs!! But, opening day was not near as crowded as years past. Economy? Yes, several vendors mentioned it. I bet you had a great time with the girls - sounds like fun.